If you are an avid hiker, then you will realize that although nature is a beautiful place, it can also be an extremely unforgiving environment. Because of this, you need to be as prepared as possible when you go out hiking. One tool that has always helped me to stay prepared when hiking has been an equipped watch. In this guide, you will see three reviews of some of my picks for the best watch for hiking that will keep you safe. What features do the best hiking watches have? Altimeter – If you are hiking in very high mountain ranges, knowing the altitude is important for calculating your hike strategy. The first hiking watch on our list is one of the most well rounded, and well liked in the market. Casio has been one of the go-to names in the watch industry, and this is because of their quality and their craftsmanship. That being said, when Casio creates a high-end hiking watch, everyone in the industry takes notice. This watch is one that is at the upper end of the price scale, but with this price comes an extreme amount of functionality. 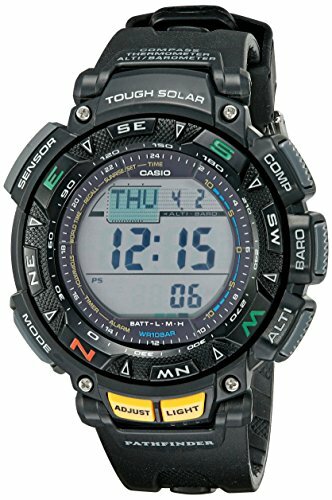 This Casio watch is completely solar-powered that features the following tools for survival: digital compass, altimeter, barometer, thermometer, and is low temperature resistant. As you can see, this watch is featured with a handful of survival tools that are extremely accurate. Along with this, this quartz movement hiking watch is water resistant up to 100 meters, which makes it great for swimming and snorkeling. Overall, this is an amazing hiking and outdoors watch that everyone should take a look at! It features a handful of survival devices that will keep you safe, and out of harm’s way when you are out in nature. Along with this, this Casio watch is produced in a stainless steel design with a resin band buckle that is extremely durable, and it can survive being knocked around. That being said, if you are looking for the best watch for hiking, then the Casio Pathfinder Triple Sensor Multi-Function Sports Watch should be high up on your list. 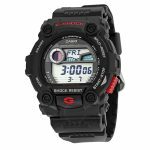 Coming in next on our list is another popular watch, the Casio G-Shock. 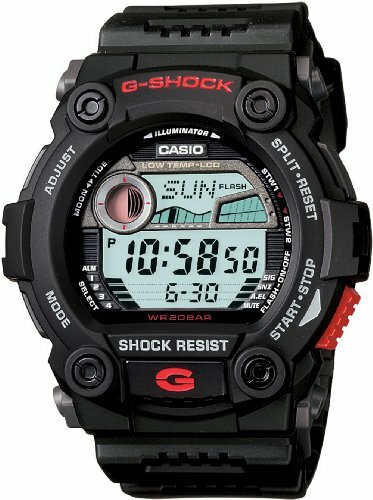 This particular G-Shock is the Shock Resist Rescue Watch with digital display perfect for hiking. G-Shock watches really took the outdoor watch market by storm because of their ability to take punishment and still function. G-Shocks, as their name suggests, is shock resistant, which means it can take bounces off rocks and other hard surfaces without cracking or breaking. Compared to the watch reviewed above, this watch is quite a bit cheaper, but it definitely doesn’t have all the bells and whistles like the Pathfinder hiking watch did. Along with this, this particular watch is truly designed for the outdoors. This watch is made in the USA, and features four impact points to help absorb damage, and revert it away from the face of the watch. The G-Shock Rescue Watch is featured with a resin band with buckle closure. I personally have owned this watch for the past few years, and it really is an amazing casual hiking watch. It is extremely comfortable with its one size fits all design. Another advantage of this watch is its water resistance. This watch is water resistant up to 200 meters, which makes it perfect for nearly any water activity except for extreme scuba diving. Overall this is a great outdoor watch, and it looks great as well. It has the bare minimum of features that you need in an outdoor watch, and it can be put through anything. If you are looking for a hiking watch that is not only comfortable but extremely durable, then this is a great option! 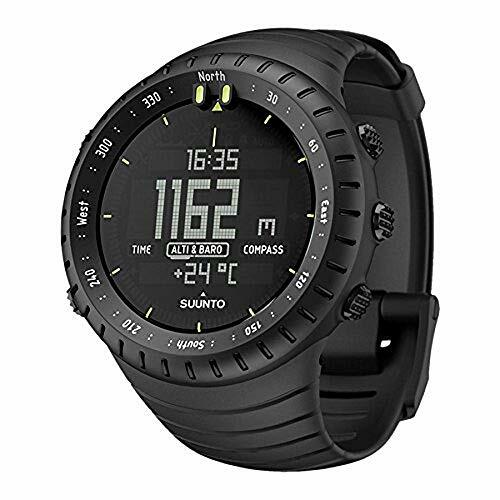 Similar to the Casio Pathfinder that we reviewed earlier, if you are looking for an all in one option for a hiking watch, then the Suunto Core Outdoor Watch is the way to go! This is another premium hiking watch, which means the price tag is a little bit higher than others, but that being said, with this price tag comes huge amounts of functionality! 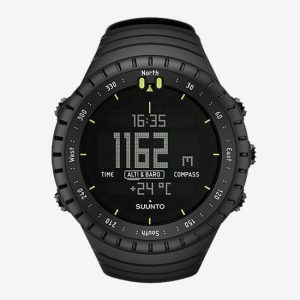 The Suunto Core features a digital altimeter that tracks your height above sea level, which is great for hiking and climbing. Along with this, this watch features a barometer that uses air pressure to alert you to nearby and incoming storm cells. This is an extremely valuable tool to have when you are hiking. If you are somewhere where you don’t have cell service to track the weather, a barometer can alert you so that you can head back or find shelter in time! Another key feature of this watch is the digital compass. The Suunto Core All Black watch has a built-in digital compass that is extremely accurate and will always point you in the right direction. Unlike the Casio Pathfinder reviewed in the beginning, the Suunto Core Watch does not have a solar powered battery. The Suunto watch is based on regular watch batteries that will need to be changed eventually. Whenever I plan on using this watch, I tend to throw an extra replacement battery in my bag just in case. That being said, this is a fantastic hiking watch, and it not only has a huge load of functionality but it looks amazing. It has an extremely sleek design, and it fits amazingly. If you are looking for an extremely high tech hiking watch that has enough features and functions to keep you alive, then you need to take a look at the Suunto Core All Black Military Outdoor Watch. Garmin is a huge player in the navigational/GPS marketplace. Not only do they do GPS watches, but sat navs for cars, boats and aviation; they have some of the best mapping technology available. The Garmin Fenix 3 is for the high-end market as it’s not cheap, especially it you go for the titanium option featured above. The watch comes with all the essential features for serious hiking like compass, barometer, altimeter but also has a heart monitor which tracks your fitness with Garmis’s VO2 technology. The watch connects to GPS via its Exo antenna and can operate in even the most remote hiking locations worldwide. The watch can be personalized using Garmin’s Connect IQ apps, so you can download exactly what you need. You can even cutomize the actual face of the watch with your own personal images or settings. This outdoor activity watch currently has over 400 positive reviews on Amazon and that’s just the titanium model. If you are into hiking, then being prepared is the most important thing. Bringing the right tools and supplies can be the difference between an amazing time camping and hiking through the outdoors, and a life or death situation. That being said, tools like altimeters, barometers, and especially compasses are extremely important! If you are going hiking, bringing the best hiking watch for your needs cannot make your hiking trips that much easier, but it can also save your life! Hiking can be so raw and torturous. It will be nice to have one luxurious item in possession. Nice article, very informative. Hiking and running is the adventure activities so that you need to have the best equipments such as watch, camera, shoes, bags etc. To have such great watch during hiking is very safe and informative. Thank very much to this great information. Great Article, G7900 is my one of my favorite hiking watch. Generally, this is a stunning climbing and outside watch that everybody should investigate! It includes a bunch of survival gadgets that will guard you, and out of damage’s way when you are out in nature. Alongside this, this Casio watch is created in a treated steel outline with a pitch band clasp that is to a great degree solid, and it can survive being thumped around. 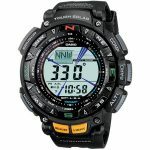 That being stated, in the event that you are searching for the best look for climbing, at that point the Casio Pathfinder Triple Sensor Multi-Function Sports Watch ought to be high up on your rundown. Solid list guys! I would also include the Garmin Epix hiking watch its similar to the Suunto as in high end GPS/mapping but is seriously expensive.